Arduino has been working with both Intel and TI to create two new boards, both of which are quite interesting departures from their previous designs. 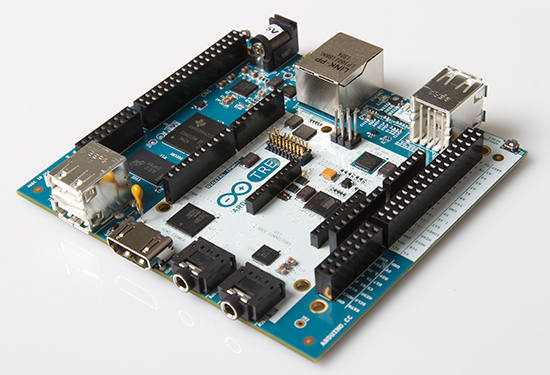 Both run Linux, in different ways but while one tries to replace the AVR microcontroller of the classic Arduino, the other hugs the classic Arduino deep into its design. The first board announced was the Arduino Galileo which is powered by Intel’s Quark SoC X1000 running at 400Mhz and in due to be available in November and, according to some reports, will be “less than $80”. The processor is a 32-bit “Pentium-class” chip and the datasheet(pdf) details how the board has a set of 3.3V (or jumper settable 5V) connectors which are Arduino Uno R3 pin compatible. There’s also 10/100 Ethernet, a PCI Express mini card slot, micro-SD slot and USB client and USB host connectors on the board. This is very much an Intel rendering of what an Arduino would be with Intel’s Quark at its core; note, for example, that for a board of its spec, there’s no video out of any form, despite being closer to the Raspberry Pi and BeagleBone Black in pricing and that from the higher side. It’s an interesting iteration which gets Intel into the emerging market of small embeddable devices, but will it play with the makers – it doesn’t look easy to go from a Galileo to a production device. The other board may be more exciting for makers, even if it is not available till next Spring and being shown now only as a sneak peek. Designed as part of a collaboration between Arduino and the BeagleBoard.org foundation, the Arduino Tre is a double processor sandwich with a 1GHz TI Sitara AM335x processor running Linux wrapped around a Atmega32u4 based Arduino – yes, the BeagleBone Black and Arduino have had a love-child and the Tre is the result; an ARM based Linux running processor to do the heavy compute lifting and networking and a classic Arduino to do the interfacing. The Tre is covered in connectors to wire up to, with the Arduino shield pins in the centre and the BeagleBone style cape connectors still on the board but separated by a whole Arduino now. How this’ll work in practice, who knows, but it opens up a range of opportunities, especially as the Tre, unlike the Galileo, has HDMI video out too. Again no official pricing and this is down for a Spring landing so a bit of a wait. Till then, if you haven’t got one, get yourself a BeagleBone Black and interface it to your Arduino to simulate at least some of the experience.